Our 1860’s Sea Captains home and 1820’s Farmhouse look due south over the beach and surf and out to the open ocean. The buildings of Acadia’s Sands stand on 200 acres at the head of Sand Cove five minutes from the spectacular Acadia National Park at Schoodic a perfect place a perfect place for your family and fiends to gather for a real Maine vacation. The peninsula offers views of four of Maine’s beautiful lighthouses and the most wonderful scenery and wildlife Downeast Maine has to offer. Our property marries all that you would expect from historic homes steeped in history that have welcomed summer guests since 1820 with an unparalleled opportunity to explore and to understand Maine’s environment and natural splendour. The buildings are available for summer rentals, either together or separately, for week or longer stays. Over the years the property have been enjoyed by gatherings of families and friends as well as various groups gathering for music & science programs, yoga and other retreats. Our buildings provide wonderful dining spaces where your parties can gather together and savour communing with family and friends. We invite you to join us here for a relaxing respite on the ocean a perfect Maine vacation. Be lulled to sleep by the sound of the surf on our private sandy beach. Individually appointed bedrooms are lavishly furnished with your comfort in mind. Our rooms feature ocean and meadow views, private baths, flowers from the garden, and the refreshing sea breeze. 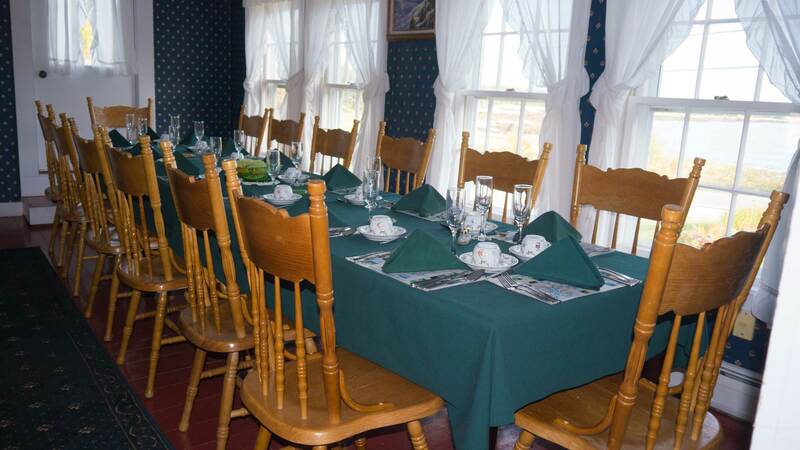 Enjoy your gathering with family and friends in the many receptions rooms with furnishings reflecting the period of the property as you watch the lobster boats ply the Atlantic just yards away. Our unique sandy beach is a great place to have a picnic, lie in the sun or take a dip in the brisk Atlantic. Explore the rugged coastline, tidal pools, and Maine lighthouses; spot an eagle or osprey overhead; try sea kayaking, yachting or fresh water canoeing. Try the trails of Acadia National Park or our own just behind the Inn. Enjoy croquet on the lawn; relax in the flower gardens or curl up by the fire with a good book or parlour game. Originally the home for Captain Allen who chose the one of the most beautiful locations on the coast of Maine to build this magnificent structure surrounded by mature a gardens and offering a breathtaking view directly due south over the property’s sand beach and out to the open ocean. To the right in this image of the north side of the Sea Captain’s Home is the library building which is the oldest building on the property dating back to the 1700’s. This building offers beautiful views over the ocean and has seven bedrooms with all private bathrooms. Additionally there are three further living rooms as well as a full country kitchen all looking over the ocean. The home was fully renovated with a focus of preserving the character and history of this historic building. Our 200 acres offers many different environs to enjoy, from the sand beach, rocky shore with wonderful rock pools, sand dunes, pond with beavers, streams that run between our buildings, miles of trails through evergreen and deciduous forest to a spectacular salt marsh. Each habitat has a myriad of wildlife with moose often seen at the salt marsh and bald eagles flying overhead. Our 200 acre estate is also the home Oceanside Meadows Innstitute for the Arts and Sciences that has its home base in the historic timber framed barn circa 1820 located on the property at a comfortable distance from the Sea Captain’s home that will not disturb the peace of the place but offers a wonderful opportunity to walk across the lawns to enjoy some of the programming. The barn, restored in 1998, now serves as a wonderful space for lectures, seminars and concerts held throughout the summer season. We look forward to hearing from you regarding bookings for the entire Acadia Sands Property, or the Sea Captain's Home and 1820's Farmhouse as separate rentals. Please request desired dates. Both the Sea Captain's and Farmhouse can be booked Saturday to Saturday for the whole week. Bookings for partial weeks can be made by special arrangement only and can be either three nights (Sunday, Monday, Tuesday) or four nights (Wednesday, Thursday, Friday, Saturday). Thank you. We look forward to welcoming you to the coast of Maine!